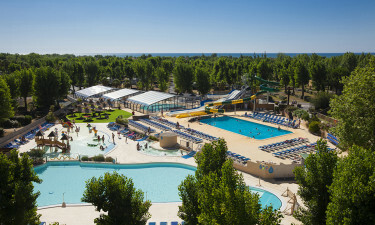 Domain La Yole is a leading LUX-camp that is situated in the enchanting Mediterranean region of France. This part of the country is famous for its intense natural beauty and long sunny days and the site makes a great base to use while exploring. Guests will also find that the site comes with a large water park and numerous other entertainment options that have been created to appeal to people of all ages. We kindly ask you to give us your registration number at least one week before your arrival (by e-mail info@lux-camp.ie or by telephone: 01 437 8555). We must provide this information to the campsite so that they can create a barrier card for you before your arrival. What Makes Domain La Yole So Special? Guests are welcome to spend time exploring the onsite discovery farm, where a wide range of fresh fruits and vegetables are grown. Children can also have fun interacting with the farm animals, which include goats, sheep, donkeys and cows, while people of all ages can learn about the healing properties of herbs in the botanic garden. 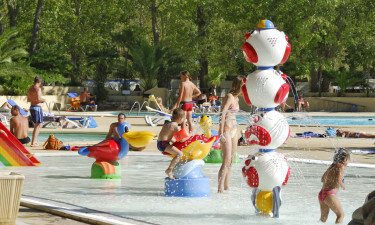 One of the most impressive features at this luxury camping site is the large water park, which covers an area of more than a thousand square metres. The kids are sure to love playing at the children’s lagoon, where they can really let their imaginations run wild. The water park also boasts several large water slides that loop their way around the park, a paddling area for young children and a rapid river pool, where people who simply want to unwind will enjoy spending time in the relaxing hot tubs. This stunning luxury camping site is situated just five hundred metres from a beautiful sandy beach. Guests will want to spend plenty of time soaking up the sun and simply unwinding on the sand here, while a wide range of different types of water sports such as canoeing, kayaking and wind surfing can be practiced in the clear Mediterranean waters that lap the sand. No luxury camping experience would be complete without the chance to indulge in a decadent evening meal. A special gourmet menu has been created from fresh ingredients that are grown on the farm and there is also a special menu for toddlers and people with food allergies. 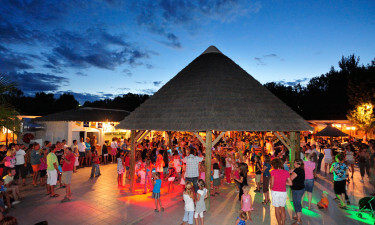 Craft markets are held every Friday evening at Domain La Yole, while the daily evening entertainment programme includes special theme nights, talent shows involving the guests, karaoke, disco night, live music performances and a wide range of other types of entertainment. Naturally, people who rent a mobile home at Domain La Yole will find that it is loaded with a television, comfortable beds and a cooking area. Charcoal grilling is also permitted at Domain La Yole and guests will be able to purchase everything they need to cook meals together on the grill, which is a great family bonding experience that can be enjoyed in the evening.